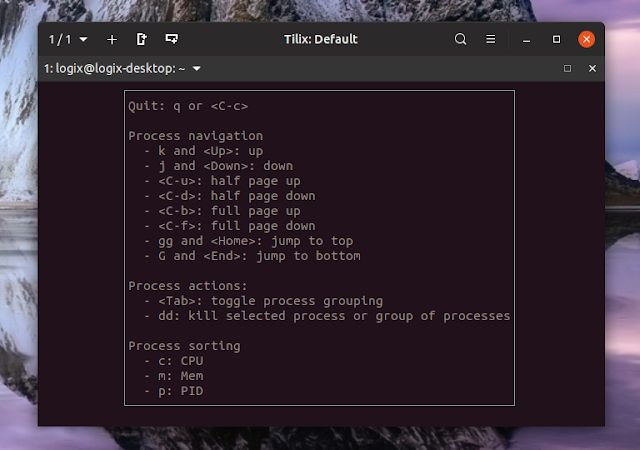 The process list allows toggling process grouping, and a process can be killed by typing dd. While you can sort the process list by CPU or memory usage, you can't filter / search for a particular process, change their priority (renice), or show a process tree, like in top or htop utilities. The memory and CPU graphs can be scaled by using h (scale in) and l (scale out). This information does not appear in the gotop help screen (that can be accessed using ? ), so I thought I'd mention it here. gotop 2.0.0, released a few days ago, also adds an option to show a battery widget (--battery), and a status bar (--statusbar), that must be explicitly called when running gotop. The status bar doesn't show on my system when activated though, so there must be some bug or something I missed. It's worth noting that some gotop widgets are constrained by the terminal size. 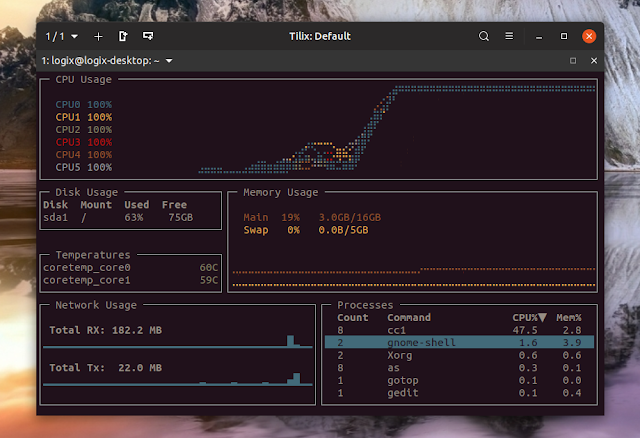 For example, you may not see all the available CPUs in the CPU usage list on the left unless you increase the terminal height. The same goes for the disks under Disk Usage, and the sensors from the Temperatures list. On the downloads page you'll find the source code, Linux and macOS binaries. To install the gotop binary on Linux, start by downloading the binary for your OS architecture. In most cases, that's 64bit, so download the archive ending in linux_amd64.tgz. Extract the downloaded archive and install it somewhere in your $PATH. -p, --percpu          Show each CPU in the CPU widget. -a, --averagecpu      Show average CPU in the CPU widget. -f, --fahrenheit      Show temperatures in fahrenheit. -s, --statusbar       Show a statusbar with the time. -b, --battery         Show battery level widget ('minimal' turns off).